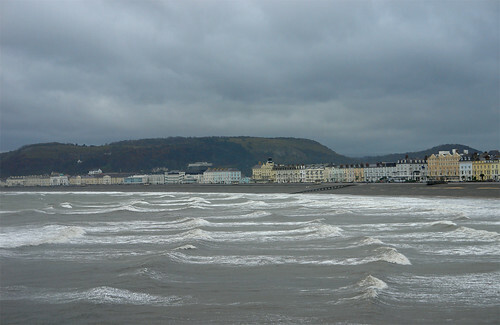 High winds, a high tide and squally showers in Llandudno this morning, so what better activity than a 'bracing' walk down the Pier? At least the cafe at the end was open, so a chance to thaw out and have a steaming cup of what was allegedly coffee was warmly welcomed. For those of us who are boring and therefore stay in on such accasions, it's good for us all to see what it's like out there. Still glad I stayed in, though! Can we send you out again later in the week on another assignment for some more wild scenes? Keep up the good work as our window on Llandudno and environs. The complete absence of any reward on your part is, of course, a reward in itself. You would never catch me stripping naked and swimming off into choppy waters like that! I seem to remember you did it once before. I can't believe that fisherman visible in the Landing Stage photo - I was wrapped up to the nines when I took that photo and was still freezing after only a minute or two - he must be crazy! !